India's crisis-torn government looked set to offer a limited rollback of its hike in diesel prices on Wednesday after a key ally withdrew from the coalition, reducing it to a minority administration and raising the risk of an early election. Prime Minister Manmohan Singh's government is widely expected to survive the blow to its parliamentary strength, but its new dependence on regional parties averse to reform will reduce its room for further steps to revive economic growth. Mamata Banerjee, the firebrand chief minister of West Bengal state, announced on Tuesday that she was pulling her party out of the coalition after Singh stood firm on a slew of economic reforms, including the opening of India's retail sector to global supermarket chains. But a concession to pull her back from the brink before a Friday deadline appeared to be on the cards after an emergency meeting at Singh's residence. A senior source in his Congress party said the government was considering a partial reduction in last week's 12 percent increase in diesel prices, which economists had long called for to rein in subsidies that have blown out the budget deficit. A government official said the hike of 5 rupees per litre could be pegged down to 3 or 4 rupees, and a new limit on the consumption of subsidised cooking gas cylinders may also be raised. However, Congress party leaders said there would be no U-turn on allowing investment from foreign retail chains such as Wal-Mart Stores into the retail sector. "The government is not in a mood to relent (but) ... there could be some cosmetic rollback," one party leader told Reuters. If Banerjee does pull her 19 lawmakers out of the ruling United Progressive Alliance (UPA), the Congress-led coalition will be left with 254 seats in parliament, 18 short of a simple majority. "The beginning of the downfall of the UPA government has started," said Ravi Shankar Prasad, spokesman of the main opposition Bharatiya Janata Party (BJP), amid speculation that the government may fall before its mandate runs out in mid-2014. While Singh can count on two other regional parties outside the coalition to prop it up with a combined seat tally of 43, both are also opposed to retail liberalisation, which could once again endanger a policy that stalled last year amid street protests. The move on retail was among a series of "big bang" reforms launched last week. They are seen as crucial to reviving India's flagging economic growth, reining in a bloated fiscal deficit and warding off the spectre of a credit rating downgrade. Singh's renewed drive for reform had cheered investors as a sign that the government was finally shaking off months of policy inertia. However, the measures sparked a furious backlash from Banerjee and other political leaders, who condemned them as a needless attack on hundreds of millions of poor people. The BJP said it would try to push for a special sitting of parliament to be convened to hold a confidence vote, which could potentially bring the government down. However, lawmakers are not due to meet for their next session until late November. Growth in Asia's third-largest economy has languished near its slowest in three years amid an avalanche of criticism for Singh's government, which has grappled with a spate of political scandals since his second term began in 2009. "The government is in a critical situation but they will somehow survive for now," said political analyst Amulya Ganguli. "A minority government cannot, however, last that long. We may look at elections being brought forward," he said. 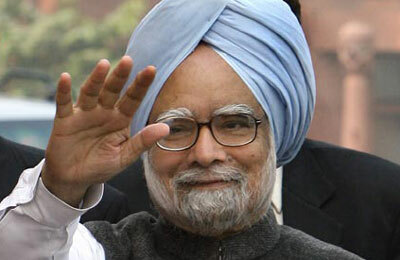 National elections are due by 2014, when Singh is expected to stand down. Several party and government officials had earlier told Reuters that Congress leader Sonia Gandhi had assessed the risks of losing coalition allies over the measures and concluded the government was safe. Banerjee came to power in West Bengal in 2011, ending more than three decades of Communist rule in the state. Colloquially known as "Didi", or "elder sister", Banerjee's supporters hail her as a champion of India's poor and dispossessed.